It’s done! (Well 99% done: I need to fill a new hole in the wall and add a piece of quarter round.) 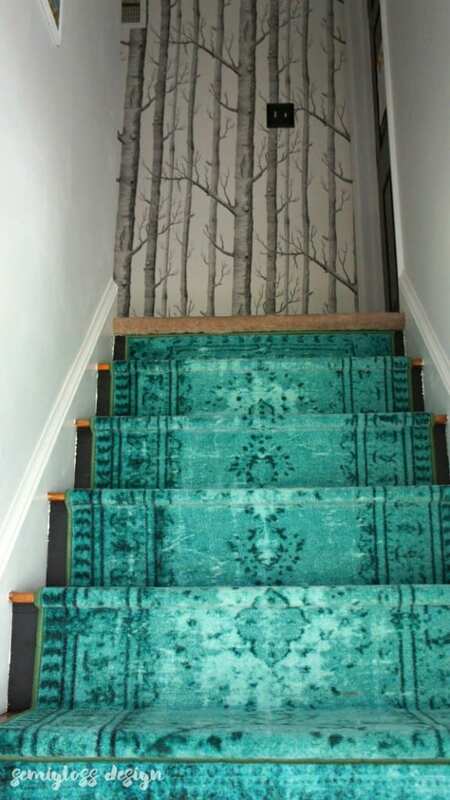 After 4 long months, I feel like I can count my staircase and hall makeover done! If you follow me on Instagram, you saw my sneak peek on Friday. Today I’m here with the whole staircase renovation reveal. If you’re interested, I’ll have a few tutorials coming for how I installed the runner, the railing and the copper handrail. It’s been a long journey. I started by painting the doors in the hallway black, then I hung wallpaper. My son and I ripped down the old railings and removed the carpet from the stairs. 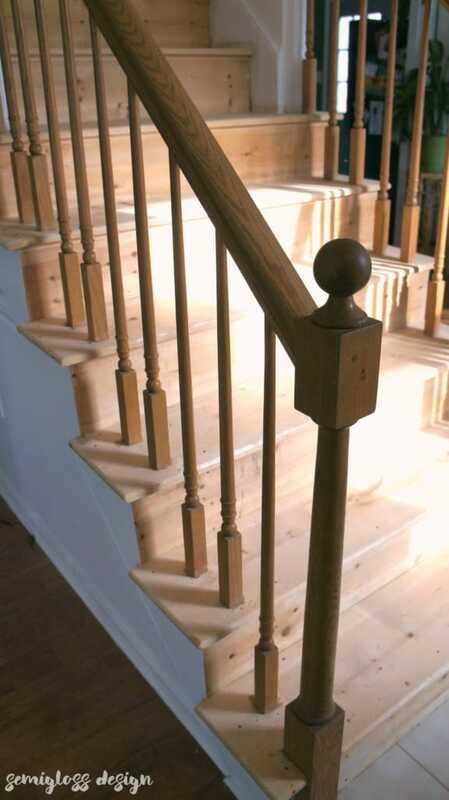 From there, we repaired the stairs before staining and painting them. I forgot to take a picture with carpet on it, so this will have to do. The carpet was your typical builder beige complete with mystery stains. Before the staircase renovation, the railings were very Colonial and way too traditional for my taste. 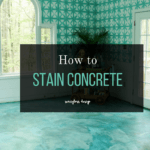 You can also see a tiny glimpse of the cream colored tile that always looked dirty. We were lucky that the treads were decent. 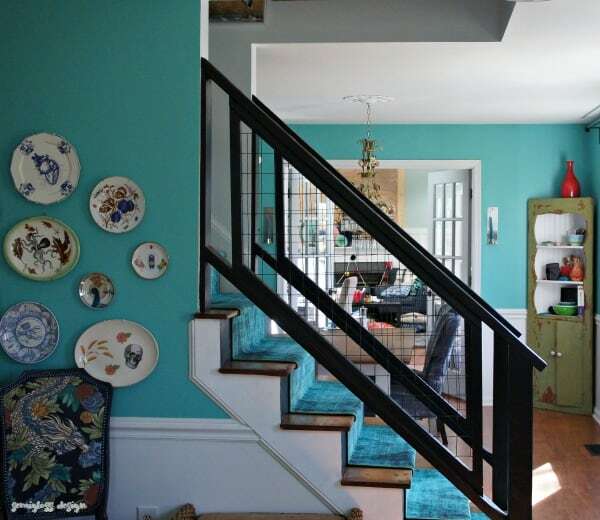 After, the staircase is modern and colorful with the addition of DIY railing and a fun runner. The staircase looks so pretty with the other rooms now. 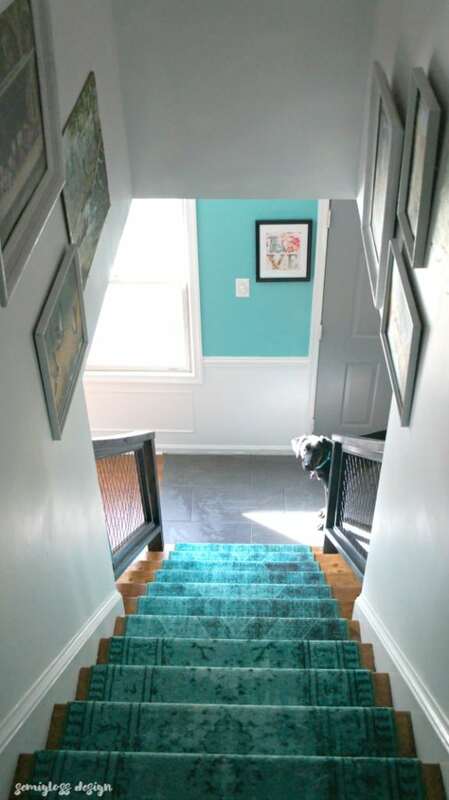 The runner was an inspiration point for the new paint color in the living and dining room. I love how it looks between these 2 rooms now. 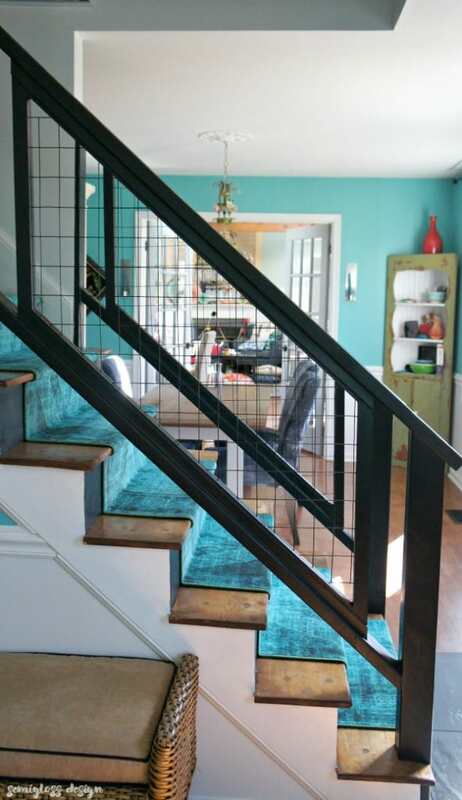 I wanted the stair railing to feel nice and open. 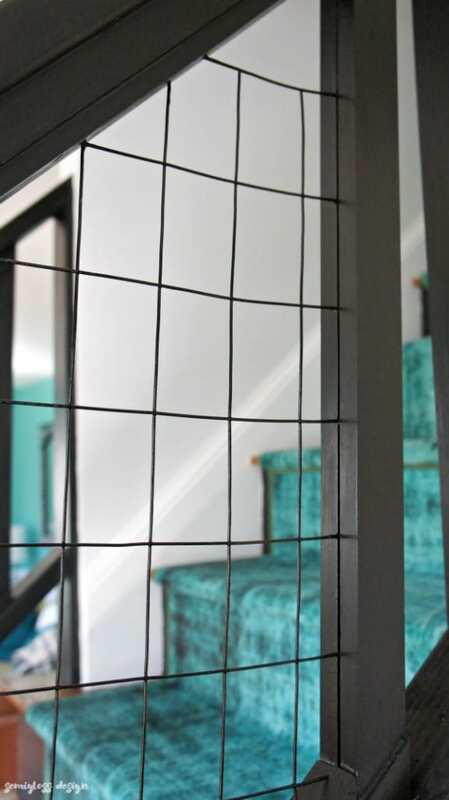 My original plans were to use wire railing, but I was afraid that it wouldn’t be to code. So I came up with an alternative that cost even less money. Tutorial coming soon, but not for the faint of heart! I wanted to cry a few times during the process, so I’m glad that the end results are exactly how I envisioned them. Visually, the rooms still feel open to each other. I really love the runner with the wallpaper. Funny story about the runner. I bought 3 normal runners from RugsUSA during their black Friday sale, but I never opened them until last Friday when I went to install them. We got one installed and I opened the other 2 and noticed that they were different. Luckily they’re the same color so they seem like they match until you look closely. It’s a happy accident and I like how unique they are. 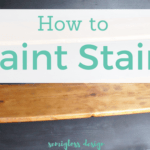 I originally wanted to plank the stairwell walls, but my husband refused because he didn’t think it was “worth dying to have some stripes on the walls.” That’s how I got him to do the tile. 😉 So instead of planking the walls, I’m going to create a gallery of bad art. My beloved paint by numbers are hung now, but I have a lot more bad art in my crawl space. The kitschier, the better! Walking down these stairs every morning is so delightful! 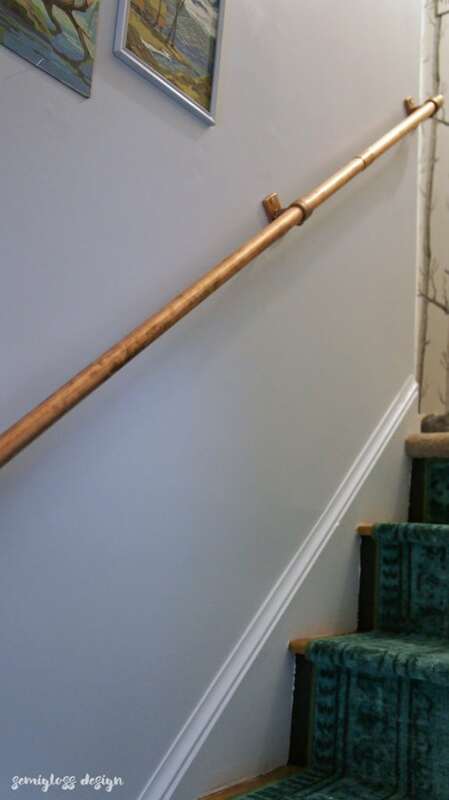 We removed the old handrail and replaced it with copper pipe. 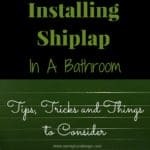 This was installed a few hours before writing this post, so it’s not in all of the pictures. This was one of the easier DIY’s and there will be a tutorial coming soon. Isn’t it pretty??? I’m going to let it patina and get even prettier! This might be the best thing that we have ever created. It’s thrilling to see your vision come to life. All the heart eye emojis! i LOOOOOOVE it! 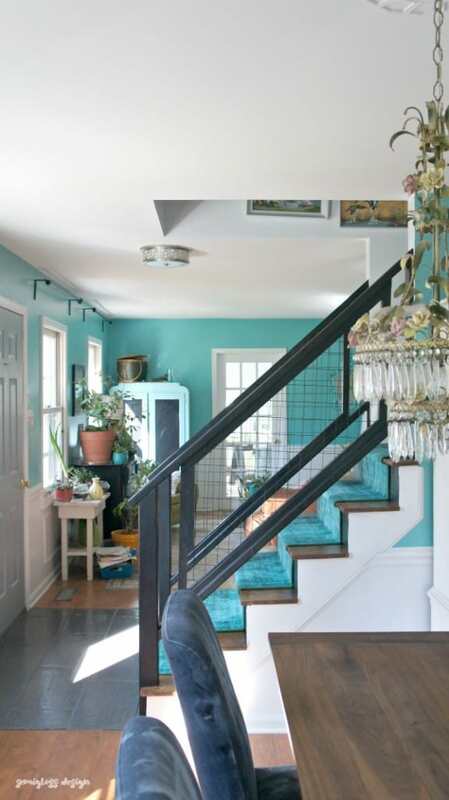 love the color of the runners and may have to do this in my playroom staircase- so good! and i can’t wait to see the railing post; they look awesome! i’m currently updating ours but just with paint- i don’t have the skills to build a new one! 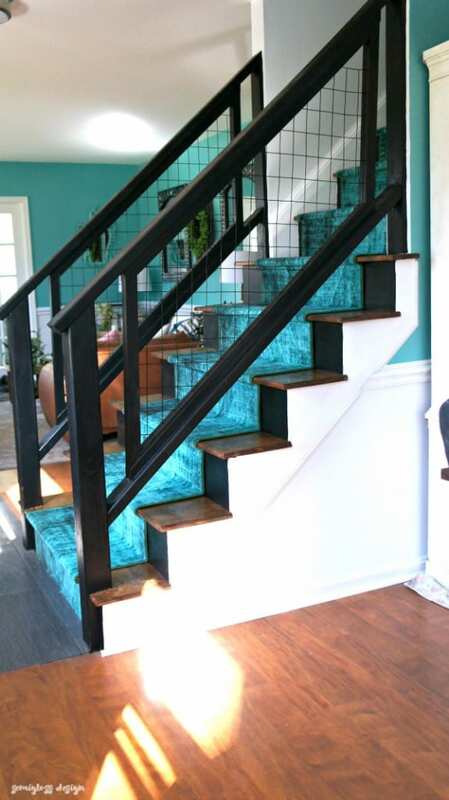 Can’t wait to see your playroom stairs! I love this redo! Love the colors as well. 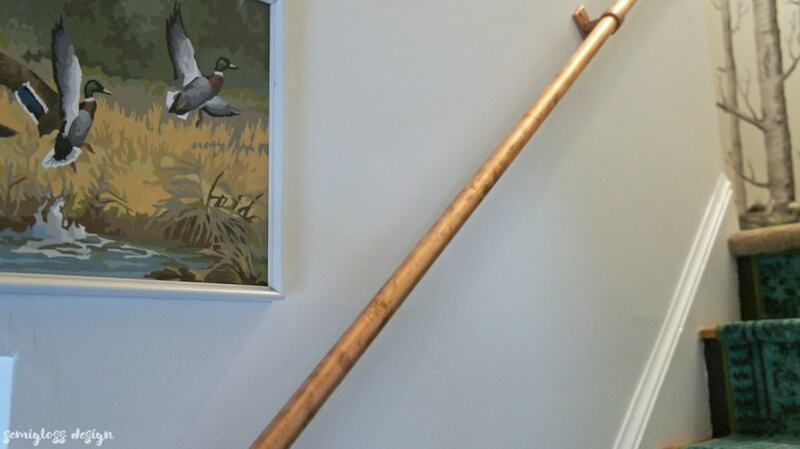 I have been thinking of redoing my stairs and love the copper pipe handrail…may use that! 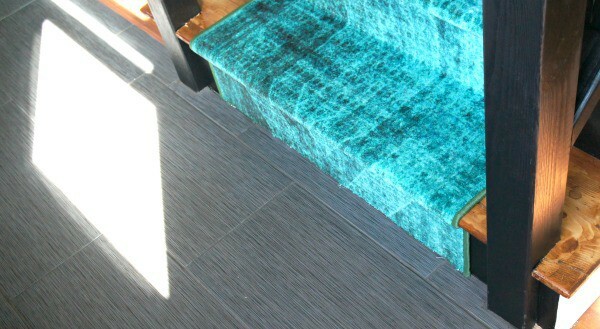 Also, love the color of the aqua walls in the living area. I would love to know what color that is. I love the look of it. Thanks! Thanks so much Bev! It’s Sherwin Williams Cooled Blue. I love the color so much and highly recommend it! 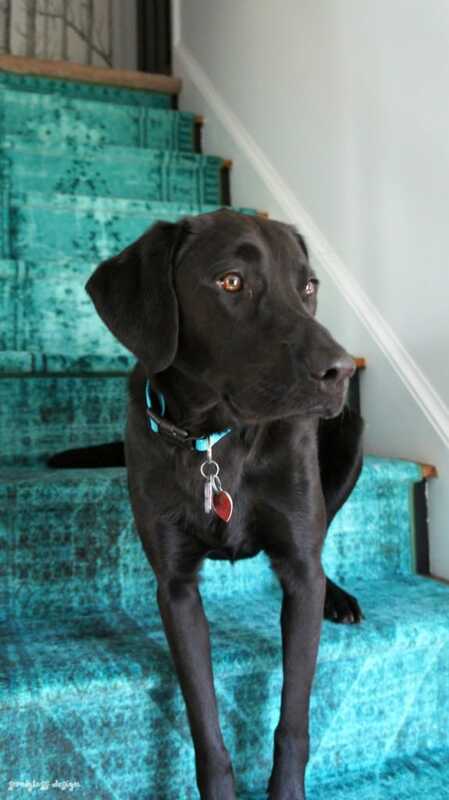 I LOVE the mismatched (yet matching) runners… and that your dog matches your home decor! ha! Oh, and the bad art… awesome!! 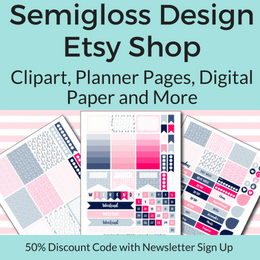 I just found your blog via Cassie Bustamante, and it looks like it’s just my style!! I’m off to check out more of your decor ideas! Thanks Leslie. 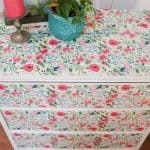 I’ve been collecting the paint by numbers at flea markets for years. I only buy them if they’re super inexpensive or if I love them.